Brotherhood of Metal, you say? Probably has something to do with hugging the person next to you at a Manowar show, eh? There’s that, yes. But the French have it different. 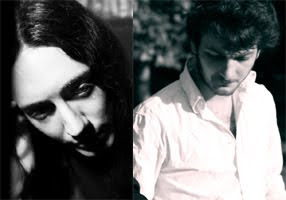 In March 2010, Alcest and Les Discrets released their new albums via the German Prophecy Productions label. Having known Alcest since their spectacular, genre-definining EP Le Secret and having been intrigued by the early Myspace demos of Les Discrets, I seized on the opportunity to do a split interview with these two bands. As we’ll see, the paths of Alcest mainman Neige and Les Discrets frontman Fursy have more than just crossed in the recent past. The official release date of the new Alcest album, Les Voyages De L'Âme, is today, and the new Les Discrets album, Ariettes Oubliées, will follow shortly after (Feb 10th). Both on Prophecy Productions, with a joint European tour to commence on February 9th. Need I say more? An interview with Neige of Alcest & Fursy of Les Discrets. Let’s start with Neige and Alcest. What do you think about the rather overwhelming response you gathered with Souvenirs d'un Autre Monde? Did those expectations put any pressure on you when you were writing the new album? Neige: For sure I didn't expect such extreme reactions with “Souvenirs...”, I had both awful critics about it and huge praise. Something happened with this album for sure, in a way or another. As for pressure, in a way yes I had because you know as a composer my worst nightmare is to make bad music, this is really the worst that can happen, moreover when you see all these great and inspirated artists making their best works during the first 2-3 album and then just mediocre stuffs it's scaring. Fortunately there are exceptions, for example the brillant last Thomas Gabriel Fisher's works. Before signing to Prophecy Les Discrets had become a fairly popular “Myspace band”. With all due respect, though, I think that some of the earlier Les Discrets music I heard was sketches more than anything, but in a pretty positive way. What made you want to take Les Discrets the more traditional way in signing to a record company? Or was this always your goal? Fursy: I actually started to compose for Les Discrets in 2003 besides my first band Phest. Then, I went in high school and I continued to compose songs, without any idea of gathering them into such a serious thing. I had not the time to record in good conditions and so I just recorded draft songs for my own pleasure and published them at Myspace for the pleasure to share. I was surprised to have that much requests and profile views with that small amount of material. When I finished school, I was contacted by Todestrieb Records and they proposed me to produce the first album. I had time and enough material and that motivated me a lot to re record songs and to start thinking about an album. Besides, Alcest was releasing Souvenirs and I think I was jealous hahha. I am kidding indeed but he gave me the will to do that. When the draft songs were recorded and when I had the album ready, we spoke about it with Prophecy and I sent the album to them, they proposed me a fantastic contract and conditions I couldn't refuse and so I left Todestrieb. It was difficult to announce it to Todestrieb as thanks to him, I am now answering your interview and releasing this album. I have a big respect for them and I am glad we are still in very good terms. You’ve played with each other in Amesoeurs and Fursy has also designed Alcest CD covers. Actually Neige said in a recent interview that if he had to compose music for Alcest with some other person, it would be Fursy... So, this goes to both of you: what makes Fursy/Neige special as a musician and as a person? Neige: Fursy is like a brother for me, we know each other since we are kids, discovered metal togather. He is maybe the person that know me the most so I guess if one day someone composes something for Alcest it would be him, he knows very well the concept of the project. Moreover it's useless to say that he is a great artist and musician, the last Les Discrets album is amazing. Fursy: Ha! I don t know what he will answer so I am hesitating on how to speak about him! He he. We are best friends for decades and we have really grown together. Means that we have discovered metal together, discovered life and wondering existencial questions together. We have also started playing music almost at the same time and we share so much memories. As a musician I admire him for the fact that he puts everything in his songs. His life is dedicated to music. He never compose nor do things that don t fit to his concept of life. I think that music is for him the best way to accept this society and the key to the beloved Alcest world. I think he knows that I respect him deeply and I know that he does too. That is friendship. As said, Fursy has designed the cover art for most Alcest releases. Neige, how would you describe the way he has been able to enter the Alcest world and his accomplishment with these cover arts? Neige: You know, Fursy and I always speak a lot about the artworks before making them, I often have a precise idea of what I want. For exemple for the cover of “Ecailles...” I had in my mind the scenary, the characters, the colours, the influences I wanted Fursy to be inspired by to make this cover. He made it in one complete day, and I was looking at him drawing, from the first sketchs to the last paint drop, it was very special to be able to see the making of it. As Alcest’s concept and the whole world surrounding it aren’t only unique but rather intimate and personal, was it initially difficult for you to get into that world? What kind of thoughts and initial aims did you have behind each of these cover arts (especially Souvenirs d'un Autre Monde and Écailles de lune)? Fursy: I actually know what is Alcest and how Neige feels/felt it. We have spoke about it thousand times and it is also something that connects us too. Alcest world has become very natural to me and I know how to represent it. The good thing is that I am a kind of gate between Neige and people, as I interpret and illustrate Alcest with an inbetween, I mean so that It fits Neige's vision but also so that people have marks and symbols that make sense to them and help them to understand Alcest more clearely. Working with Neige is always interesting as we always try to evoke and paint new faces of the Alcest world. I realise this is a difficult question but do you consider yourself first and foremost a musician or a painter/visual artist? Do you get your living from either? Fursy: Arfff... Difficult. It depends of my state of mind. Today I think I am more musician but tomorrow I will think the opposite! Basically I need both and both make me what I am. That is always difficult as I have to make serious choices in my life these days, and that question still remains unanswered! Neige has stated that Alcest is “music from another world” and that the sentence should be understood literally. Neige, can you please describe this world to people who’re interested in Alcest and its music? Can that other world be compared to the one we live in? Neige: Yes, this world and these concepts are the foundations of Alcest, the raison d'être of this project. Alcest is a way to musically translate an esoteric experience I had during my childhood until early teenage years. Let's be clear, we are not speaking about imagination or fantasy, but about a real event which had and will always have a big impact on my life. As a child I was used to have sudden visions, memories of a place that is not the one we know. The things that came to my mind, with the precision and the evidence of any “real” memory, had nothing to do with anyone can know or imagine there. These were images about an indescribably beautiful haven where everything - trees, glades, streams…- produces a pearly light and where a faraway and celestial music floats in the air like a perfume. In such a place the spirit wanders without its mortal coil and deprived of the five senses pertaining to the body. It perceives what surrounds it in a completely different way. There, one no longer feels moral and physical suffering, diseases, anguish of death but only a feeling of peace and indescribable ecstasy. This heavenly place is inhabited by beings of light who are infinitely benevolent, protective and who communicate by talking directly to the soul, in a «language» beyond words. Now the memories of my present life tend to replace ancient ones if I can say but they will always remain inside me. In a recent interview Neige said that Alcest as such is “not about making beautiful music.” Nevertheless the feelings carried in Alcest are esoteric, ethereal and nostalgic which could be labeled as positive (if not beautiful per se) emotions. If I had to describe Alcest’s music with only one word, I’d probably use the word ‘hopeful.’ In what ways is the concept of hope relevant to your perception of Alcest? Neige: Hope is a big part of the Alcest concept since this experience learnt me to see life with another eyes, to see the beauty behind all the things that is surrounding us, the magic of existence, the magnificence of nature and what is surrounding us here, to take advantage of precious events, and to value the links we can have with the persons we love. In a world where there is so many sufferings and things going wrong I think this is important to keep being optimistic and conscious of the privilege of existence, to find our own equilibrium. Neige: I do believe in the immortality of human soul and in life after death, here or somewhere else. If didn't have these “visions” I would certainly not believe in this but due to this I can't have a single doubt about it. And despite some life's dramas as illness, death, suffering, though unfair events that can happen suddenly I am seeing a sense in existence, a goal that every soul tend to reach. A terrestrial life could be comparable to an exercise we repeat again and again in order to always learn more, to improve, to evolute and to raise our spirit in order to reach another state of existence at the end. I know all this can seem naïve but I deeply believe that death, the oldest human fear, simply doesn't exist. Then back to Les Discrets. I’ve understood that your music is at least partly about your fear of death... Does Les Discrets help you deal with that fear and how does that fear come through in the music, in your opinion? Could you somehow describe this fear of death – how does it present itself in your everyday life? Fursy: Yes. I am very scared of Death and of emptiness. This is something that remains since a long time and I don t know why. I live everyday with thoughts and scarying pictures of my close family, friends and girlfriend passing away and I live in pain often due to these thoughts.. I really cannot kick these dark fears out off my mind. That is difficult sometimes. Les discrets does not help me to fight this fear, I just share it and express it and interpret Death in the way so that I can accept it better. The cover art for the album could easily be seen as representing death (the character on the right especially – and I must say that the cover is one of the best I’ve seen in a long time!). What forms does death take in your dreams, for example? Does “he” come in the form of the traditional grim reaper or does he take more esoteric and weird forms? Which representations of death by other artists (films/music/visual arts) can you mention that have touched you deeply? Fursy: Actually, death has no shape to me. I recently represented it through birds, but in a few years it will be different, as Death exists to me only through my fears. Indeed people die and disappear from Earth but I trust that there is another form of life after the Earthy one in which lovers can live together for ever. That is what I told in my film "tir nan og" we included to the artbook edition of the album. Watch this film and you will understand my thoughts better than reading these lines as it is quite complex. Neige stated in a recent interview that “Alcest is not only music or art but a spiritual quest.” What kind of things have you found so far on this quest? Neige: Not so much for the moment. I just found some things here and there, about astral planes, astral journeys, Near Death Experiences but nothing that deals precisely with what I had. I never met anyone in my case neither and I would really like to. So, after having looked for answers, I guess that I could still have memories of the place (or one of the places) the soul would go after death, an haven where we would rest, be free of the burden of incarnation before starting a life again. Is Les Discrets a spiritual quest for you, Fursy? And if it is, what have you found so far on this quest? Fursy: This is not a quest, as I do not await for any answers. It is simply interpretations of my life, fears etc and I hope that some people will understand what is behind everything and I hope that, in the future; people will be able to look at my whole production and say " this guy has kept his goal all his life long and we can understand his point thanks to everything he did!" it is not megalo, I just know how people like Friedrich or Bauer have changed my life and helped me to understand myself. If I can do the same at least for a single person, that would be fantastic. If there is a quest, it is an artistic quest! One question about Amesoeurs... A few years ago (a little after the Amesoeurs MCD and before the Alcest debut album was released) Neige stated that you need these two extremes (Alcest and Amesoeurs) to reach some kind of balance. When you ended Amesoeurs, did you feel that you could find this balance without Amesoeurs, or do you already have another musical outlet for the sort of emotions that were essential in Amesoeurs? Neige: I don't need to express emotions related to Amesoeurs anymore, I said what I wanted to say with this project. The only consequence is that since I don't have Amesoeurs to express some of my negative and desperate feelings Alcest music can be a bit darker than before in some moments. Fursy said in one Amesoeurs interview that in Amesoeurs you were driven by the “fantastical idea of cities, angst and esthetics.” To what extent do these same feelings inspire you in Les Discrets? Fursy: Almost not at all. The only positive things the cities give me is the incredible access to culture (theater, opera, concerts). Strangely, the more I am living in the city, the more people disgust me, and the most I feel I am not walking the same planet than them. That is horrible and I would love to enjoy parties with people as everybody does, but I cannot. I suffer in cinemas when someone sits near to me, I hate subway in rush hours as everybody is glued, people speak about nothing but their own pathethic occidental problems related to money and house etc. It is not inspiring at all. We have definitely lost our spirituality. And the last question: what is your best memory that has something to do with Fursy/Neige? Neige: My best memory with Fursy is a summer holidays more than 10 years ago that we passed in La Bourboule, a French thermal city in the Auvergne region. The song “Les Iris” was inspired by this memory particularly. This place is so beautiful, we were young, so imaginative, the head full of dreams, I just discovered black metal and was totally obsessed with this music. I feel a strong nostalgia for my early teenage, this was maybe the most exciting period of my life. Fursy: Ha, that is defintely when we were young, a city in the french mountains in which we were going for holidays,called La Bourboule. We had so many good moments there, and it is a great inspiration for both of us. The "Les Iris" Alcest song comes from there! And I will also have a song dedicated to that city!